Cover the cardboard tube in white construction paper using a glue stick. Cut 2 circles from additional white paper and glue them to the bottom of the tube for Olaf’s feet. Glue black pom poms to the front of the cardboard tube. Roll the orange pom pom between your palm to flatten it out a bit and glue it on the front of the tube for the nose. Glue the googly eyes above the pom pom nose. Use a black pen to draw the eyebrows, smile and tooth. The easiest way to make a hole in the side of the cardboard tube (for the arms) is to poke a stick pin through it first, then remove it and poke a toothpick into the hole to make it larger. Now you can poke the twigs through the hole. Glue the small twigs (mine are actually leaf stems I found outside) inside the top-front of the tube. 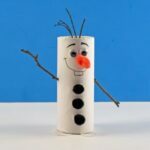 This project for Cardboard Tube Olaf Craft from Frozen was printed from CraftsbyAmanda.com - https://craftsbyamanda.com/cardboard-tube-olaf-craft-frozen/ and can only be printed for education or personal use.